A new user review has been published on OCinside.de. 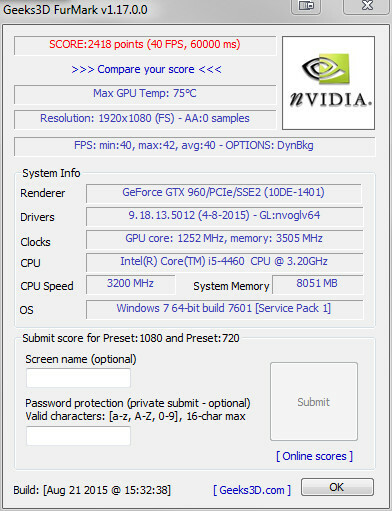 This time the video card MSI GeForce GTX 960 4GD5T OC has been tested by user Hipp0campus. The price class of 200 EUR is traditionally fiercely fought over by the two leading manufacturers AMD and nVidia. The price-conscious gamer can usually find a fitting piece of hardware in this category for letting him/her play the most recent video games at high settings. Currently the search for a card of this range for your pc turns out to be more of an act of faith. The nVidia GTX 960 as well as the AMD Radeon R9 380 are equally good choices. One point in favor of the GeForce card would be the lower Power consumption under heavy loads, but we will get to that later on. 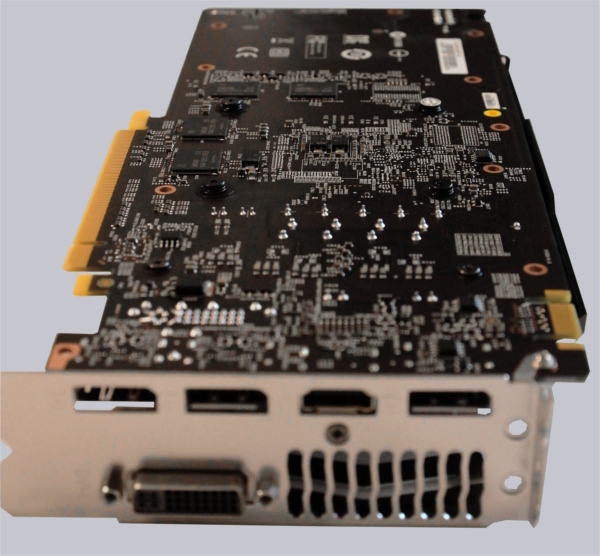 I took a closer look at the card with the cryptic name "GeForce GTX 960 4GD5T OC" manufactured by MSI. This particular version has 4GB of video memory and a custom cooler with two fans. Beforehand: As a small goodie with every gtx 950/960 buy, you'll get a code for the Blizzard MOBA "Heroes of the storm" which can be redeemed at redeem.geforce.com. The bundle contains a hero, a skin and a 7-day stimpack which is a boost for ingame currency. 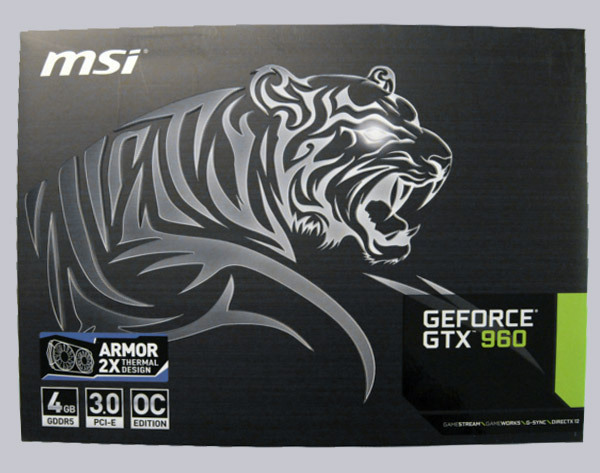 The box of the MSI GTX 960 4GD5T OC comes in a simple color scheme with aggressive tribal-tiger. 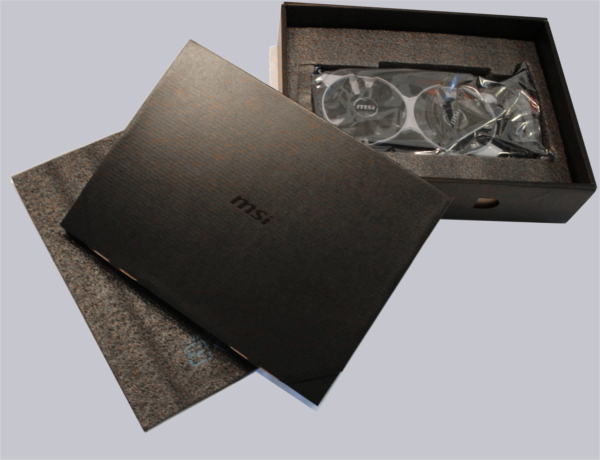 The inside of said box reveals a cardboard folder with a high quality feel to it which contains the accessories. Underneath you'll find the very well cushioned video card. The accessories is one of those points where you'll notice the pretty low price of 212 (September 2015) for a GTX 960 with 4GB memory. MSI adds a CD-Rom with drivers, a DVI-to-VGA adapter, a 6-pin to 8-pin power connector and a somewhat confusing user's guide in poster form. Well, let's put the accessories in a dark drawer and get to the main course, the video card! This category is worth a closer look. nVidia does not provide a reference design and so it's up to each manufacturer to implement its own ideas of the perfect layout. Dimensions and display ports are similar to what most other manufacturers have to offer. With a length of 27cm the video card does not belong to the shortest ones but should fit in most (midi tower) cases; It might be a tight fit for ITX builds. It gets interesting at the clock rates; MSI pushes the GPU from 1,126 to 1,178MHz and from 1,178 to 1,241MHz in boost mode. The memory clock, however, remains almost untouched. With a TDP of 120W the GTX960 lies a whopping 50W below its AMD counterpart. 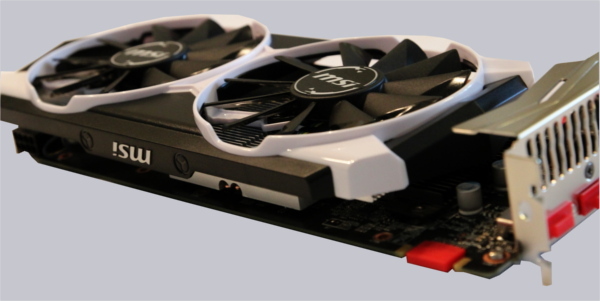 The MSI GTX 960 4GD5T OC has a 2-slot design, but the third slot should remain free to avoid blocking the fan. 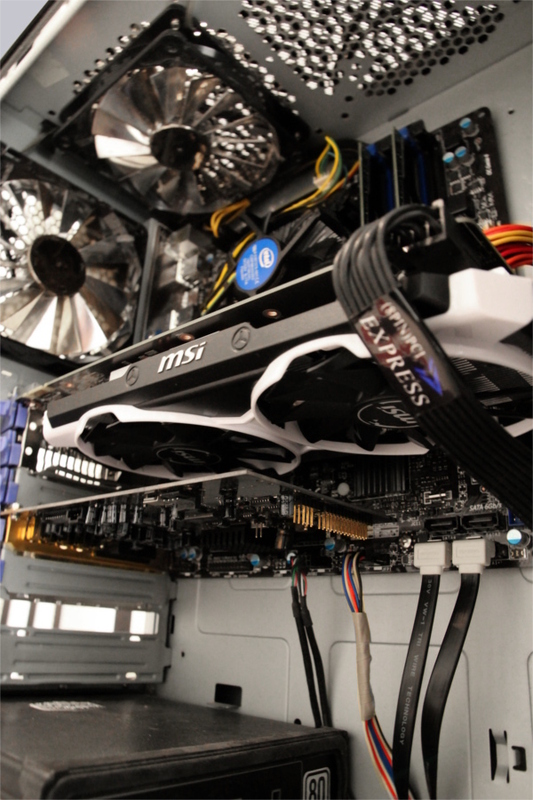 The design is dominated by the black and white cooling system with the intimidating name "ARMOR 2X" with two 100mm fans. 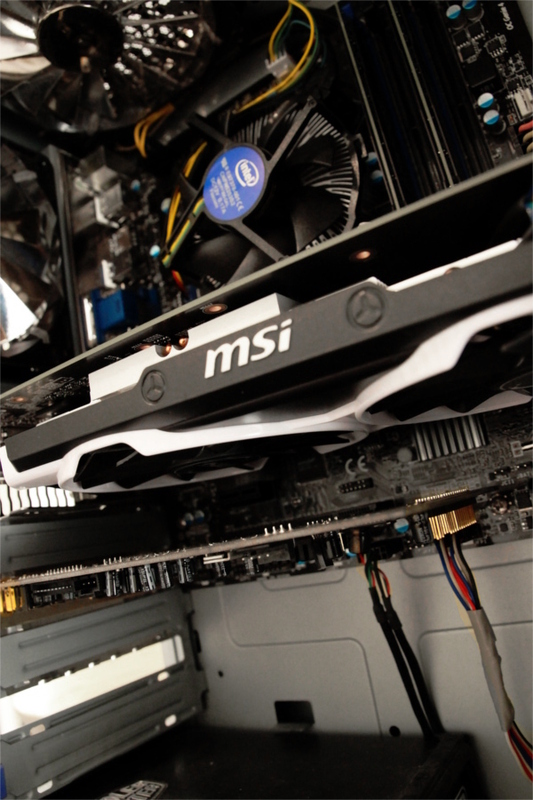 The fans will start to work above 60°C and even then operate very quietly. On this card MSI skimped on the heatpipes. Similar cards often use 3 heatpipes where this one relies on two. However, as the temperature values show us (45°C in 2D mode and 75°C during stress test) the cooling system is more than adequate. The matt black PCB fits in seamlessly with the color scheme. 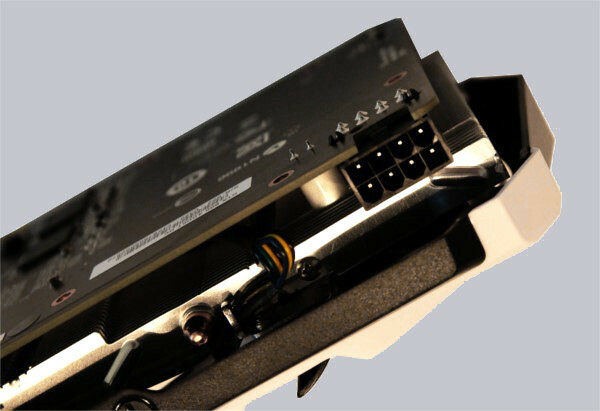 The video card gets the power through a single 8-pin connector which faces to the case wall as in most cards. Therefore you should plan in an extra inch when placing the card in a narrow case. This benchmark was chosen as a practice-oriented test, as it simulates the demands of latest games with lots of shaders and particles. 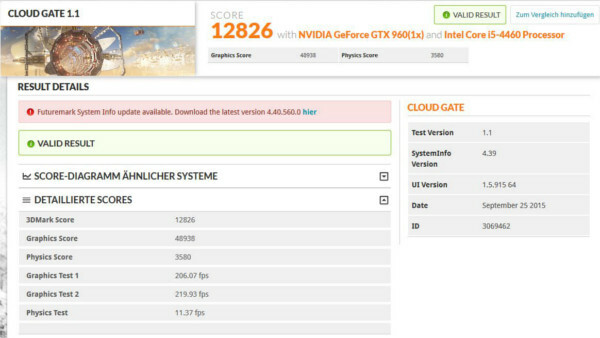 The tested setup achieved both in graphics as in overall score a hiquer rating than the setup from the review of the Sapphire Radeon R9 280 which is the AMD counterpart. In practice, however, this is likely to lead to just a few fps more at most. This test will show us what the ARMOR 2X cooling system is capable of. 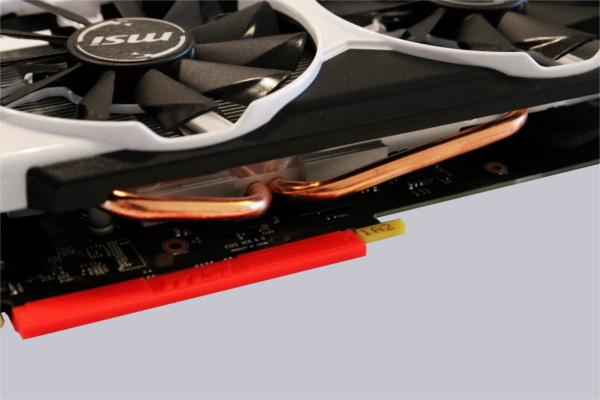 In burn-in mode the tested GTX960 will produce 120W of heat (TDP) and thus 70W less than the AMD competitor R9 380. At a maximum temperature of 75°C the fans were at 54% and were barely audible over the boxed cooler. Even if you set them manually to 100°C you will only hear the air-flow, neither rattling nor clicking sounds appeared. This GTX960 offers a respectable performance for a video card in the 200€ sector and it has a cooling solution which allows a conversation in whispers even under full load. Whoever read my review in detail will not be surprised that I can recommend the MSI GTX 960 4GD5T OC. Anyone looking for a GeForce video card at about 200 EUR with 4GB of video memory can definitely buy this one. A quiet (keyword semi-passive) overclocked card with stylish design and ultimately a very reasonable price for its specifications is hard to find. The only downer is a fact we can only speculate about at the moment. There are persistent rumors that AMD GPUs will have a significantly better performance with upcoming DirectX12 (windows 10 only). But there's no fault in that from manufacturer MSI and therefore they get a thumbs up from me for designing this video card. 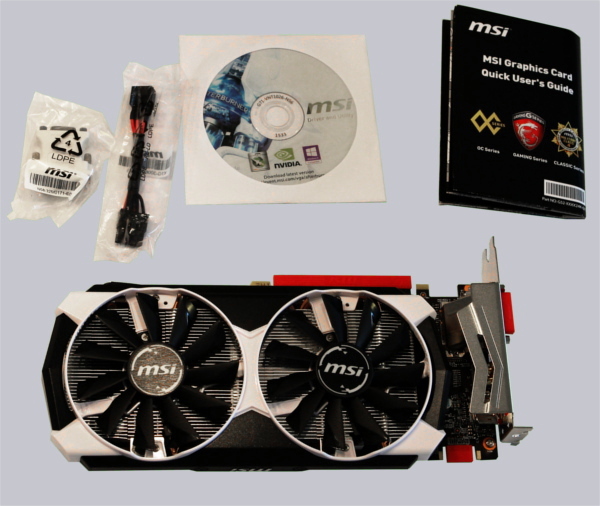 Here you can purchase the MSI GTX 960 4GD5T OC video card inexpensively.